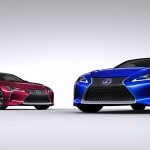 First revealed by Akio Toyoda at the 2016 North America International Auto Show, the styling, performance and craftsmanship of the new Lexus LC 500 clearly position it as the flagship coupe of the Lexus lineup. 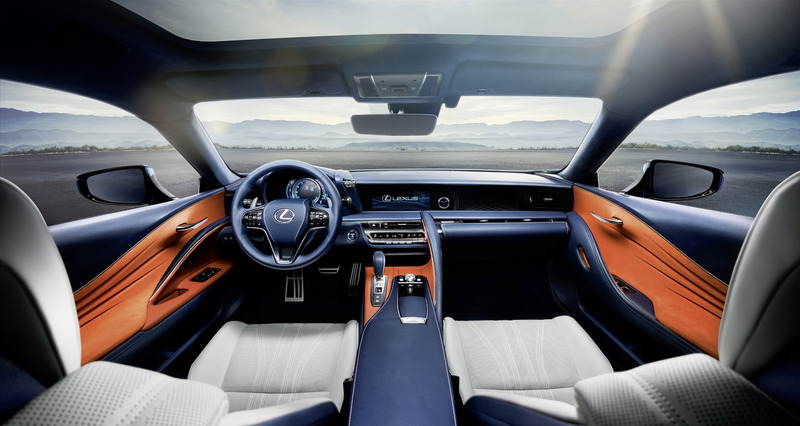 Inspired by the acclaimed LF-LC concept that debuted in 2012, the LC represents a shift in Lexus’ engineering processes and design direction, and marks the beginning of a new phase for the Lexus brand. 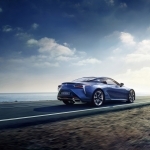 Following the world premiere of the V8-powered LC 500, Lexus introduces the All-New LC 500h which features the world’s first Multi Stage Hybrid System, the next generation of hybrid powertrains specifically designed for performance vehicles. 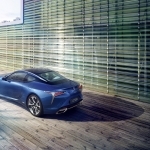 Seduction & Technology Design Combining avant garde elegance with dynamic coupe proportions, the seductive form of the new LC 500h remains remarkably true to the key design elements, proportions and visual dynamism of the award-winning LF-LC concept car that inspired it. The LC 500h is enveloped by a glamorous exterior which represents a uniquely evocative, more fluid interpretation of Lexus' L-finesse design philosophy. With a long 2,870 mm (112.9 in) wheelbase, compact 920 mm (36.2 in) front and 970 mm (38.2 in) rear overhangs and a notably low bonnet line, the coupe's athletic profile is characterised by a sweeping roofline which tapers from the central position of the occupants, creating a uniquely human-centred silhouette. 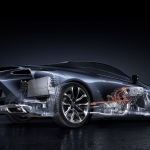 Front and rear wings that house wide, large diameter wheels flare away from the centre position of the occupants, whilst the door sides are pulled inwards to create a powerfully three-dimensional form—in plan view, a new spindle architecture shape which mirrors Lexus' signature spindle grille. To the front, the latest interpretation of that spindle grille motif features chrome trim and a radical new mesh design of varying visual tension. The LC 500h's unique lighting signature combines independent, arrowhead Daytime Running Lights (DRL) with a triple LED headlamp unit, the ultra-compact engineering of which has helped to maintain the coupe’s low bonnet line and short front overhang. 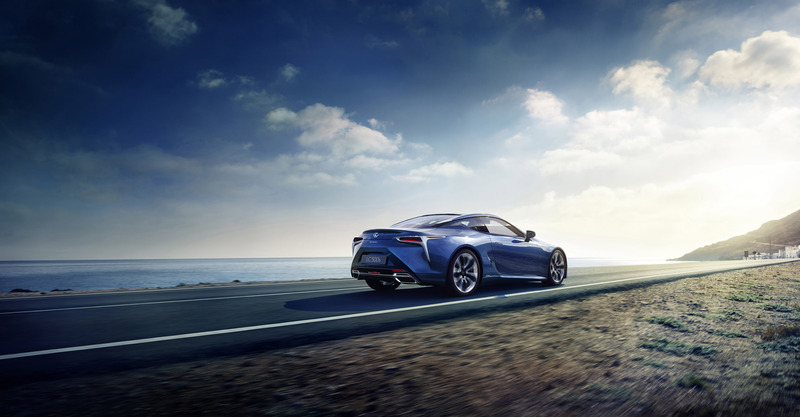 To the rear, the sweeping cabin roofline tapers between broad, muscular rear wheel arches to reinforce the LC 500h's wide, stable stance. The rear lamp signature is equally unique, a sequence of increasingly strongly lit L-shaped LED lamps that creates an exceptional three-dimensional impression. 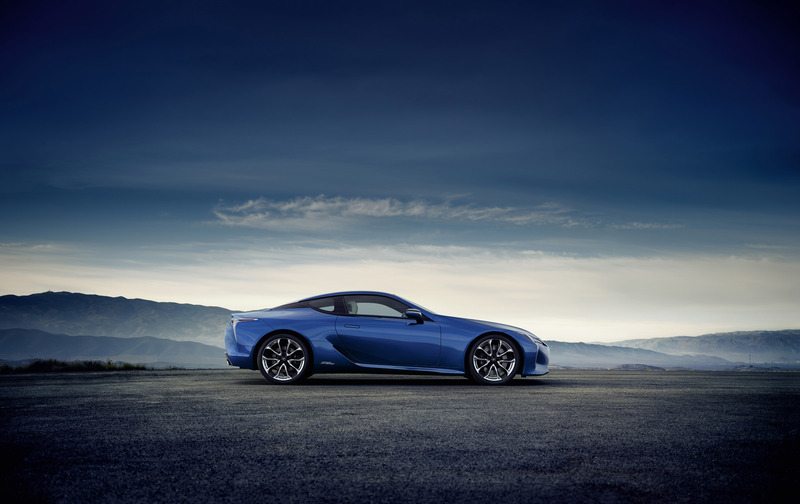 The outstanding driving dynamics of the LC 500h are also reflected in subtle yet functional aerodynamic measures. Front and rear wheel arch venting improves high speed stability, and a rear diffuser and active rear spoiler further manage airflow during performance driving. The new LC 500h will be available with a choice of bespoke, 20" cast and 20" and 21" forged aluminium alloy wheels. 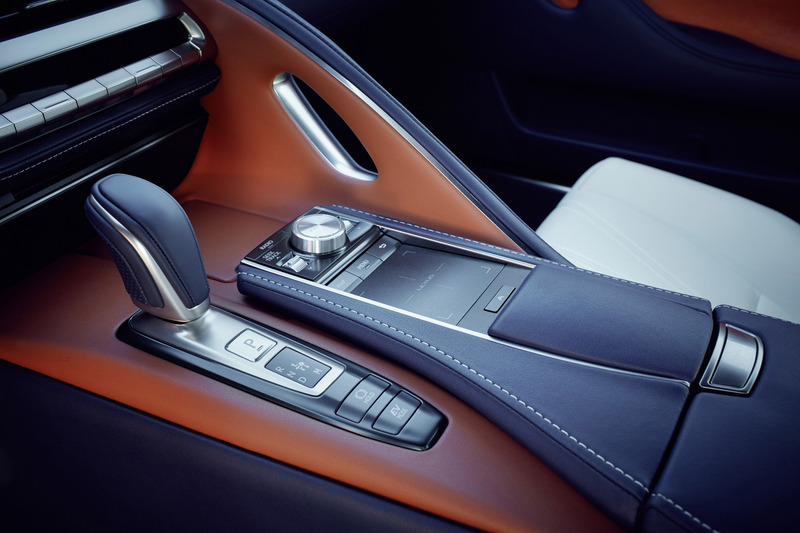 Driving Pleasure & Comfort The all-new interior design of the LC 500h reflects the exterior design theme of dynamic luxury with a cabin that combines all the elegance, quality and sophistication of a Lexus premium coupe with high driving pleasure and comfort for passenger. Whilst the front passenger area is shaped to spread out towards the front, creating a comfortable and welcoming space, the driving position has been painstakingly created to invite spirited driving, and promote driver confidence through an intuitive control layout and ergonomic excellence. The driver's hip point has been engineered to be as close as possible to the coupe's centre of gravity, maximising feedback from the vehicle to the driver. And the holding performance of the seats has been enhanced through a renewed focus on the cross-section design. Particular attention has been paid to the design of a new steering wheel, which features a change in cross-sectional shape throughout the rim circumference to accommodate variations in grip and the twisting of the wrist during operation. And new, larger magnesium alloy paddle shifters have been shaped for easier reach and a more positive action. All information displays have been carefully arranged in order of importance by their proximity to the driver's sight line. The instrument binnacle itself houses a variation of the innovative driver's meter with moving centre ring from the LFA, and the centre console features a next-generation touch pad for the Remote Touch Interface (RTI). The 2017 Lexus multimedia package debuts with the LC, and features faster, more flexible software enabling future enhancements and an updated graphic user interface. Listeners will also be treated to an exceptional audio experience inside the cabin: in addition to the available audiophile-worthy Mark Levinson audio package, a new premium Pioneer audio system comes as standard equipment. 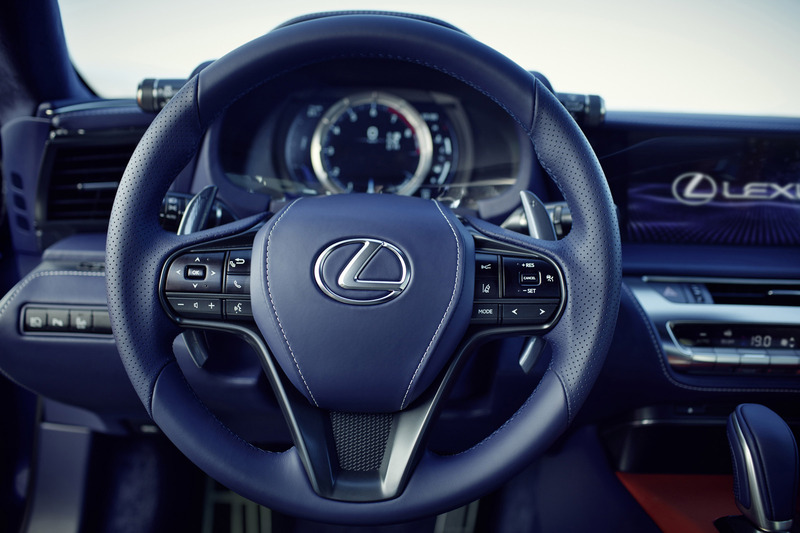 Throughout the new interior, the quality and finish of upholstery, hand-stitched leather centre console and dash pad, and drape forming Alcantara door trim, reflect a level of Takumi craftsmanship and attention to detail for which Lexus is globally renowned. Multi Stage Hybrid System The Multi Stage Hybrid System was developed with opposing goals in mind: to create a hybrid with a more sporting and engaging driving experience by closely aligning engine speed with throttle inputs, and to achieve the best possible balance of power and fuel consumption. 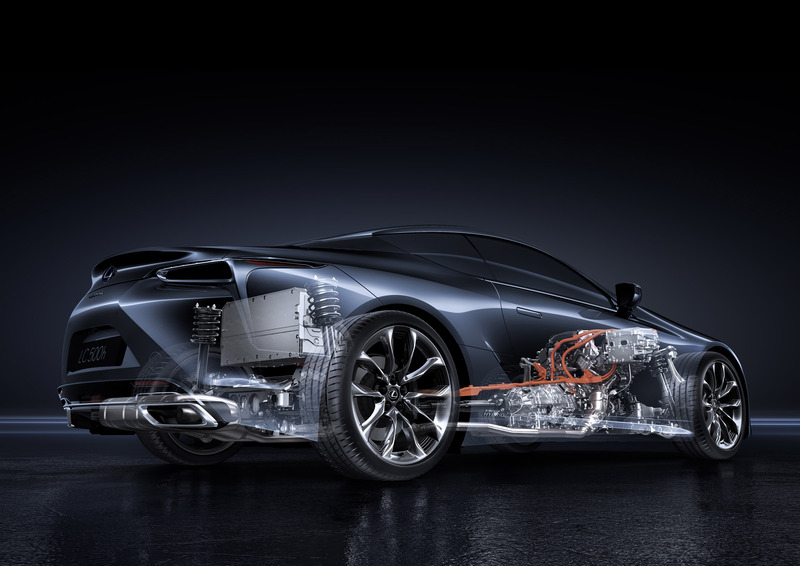 The new Multi Stage Hybrid System marries the elements of a traditional full hybrid powertrain -including a 3.5 litre V6 petrol engine, a powerful electric motor and a lithium-ion battery pack to a 4-speed automatic gearbox mounted at the rear of the hybrid transmission. The electric motor generates better acceleration feel than a conventional engine, and adding physical gears more closely aligns engine rpm with the driver’s inputs. 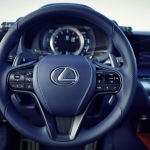 The result is a much more direct connection between the accelerator pedal and vehicle acceleration, and 0-100 km/h times well into the sub-5 second range The Lexus Multi Stage Hybrid System also features ‘M’ Mode—the first driver-initiated gear shifts offered on a Lexus full hybrid powertrain. ‘M’ Mode gives drivers the ability to initiate direct and responsive gear shifts for the most sporting and engaging drive yet from a Lexus hybrid. A new lightweight and compact electric motor and a lithium-ion battery offset the weight of the added automatic transmission, and so the Multi Stage Hybrid System weighs the same as the current hybrid powertrain—an amazing feat of engineering. 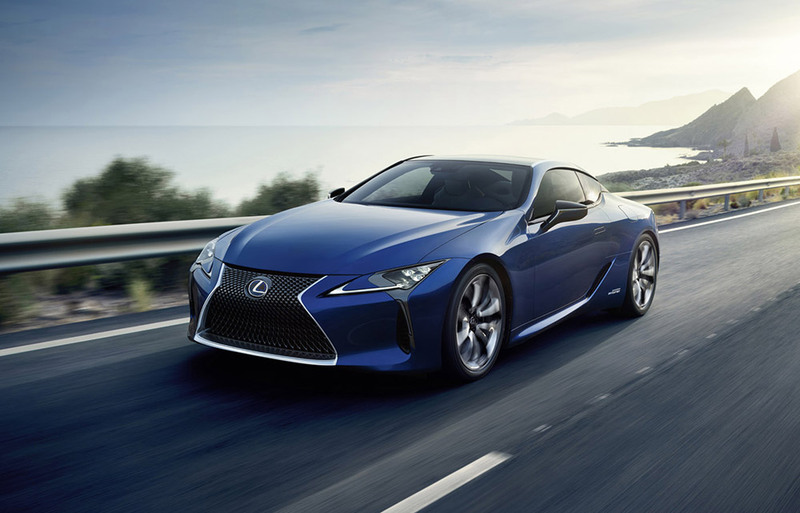 All-New Platform Heralding a new generation of more engaging and responsive vehicles, the new LC 500h has been designed to offer customers a significantly sharper, more refined driving experience. 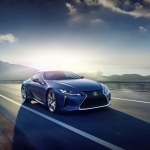 It combines the superior ride quality befitting a flagship luxury sports coupe with an engaging, dynamic drive and a depth of character unlike that of any previous Lexus. 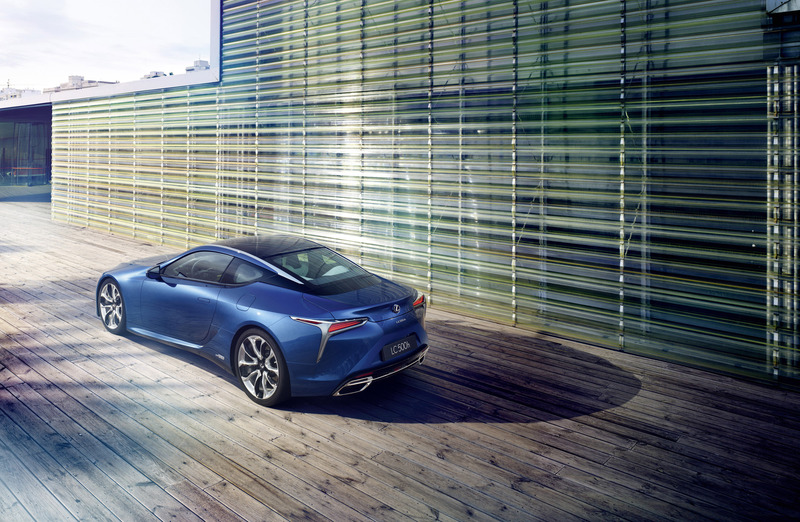 The LC 500h is the first Lexus to benefit from the company's all-new, premium rear-wheel drive platform; part of a new corporate global architecture for luxury vehicles (GA-L). 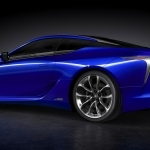 The underpinnings of this new coupe will become the blueprint for future front-engine/rear-wheel drive Lexus models. Platform design is fundamental to dynamic handling characteristics. 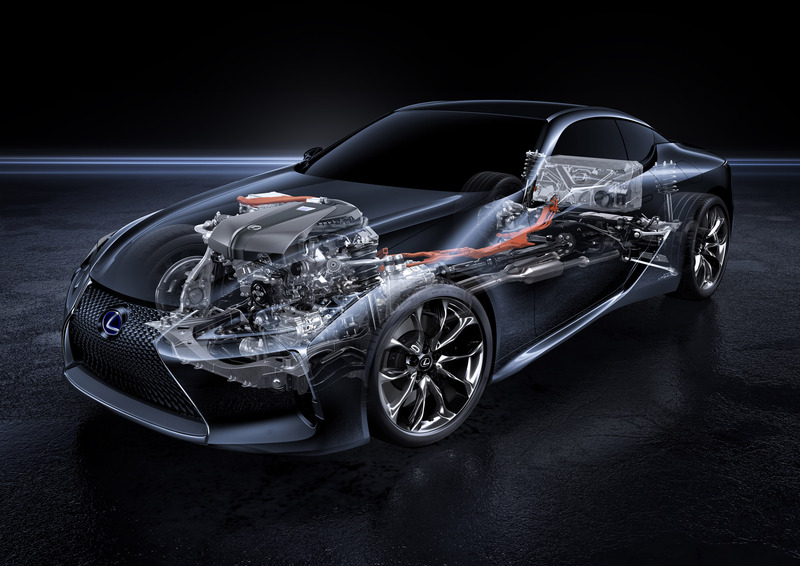 At the outset, Lexus engineers focused on what they refer to as the LC 500h's “inertia specification”, placing most of the vehicle mass, including the engine and occupants, as low and centralised as possible within the chassis. The powertrain mass is located behind the front axle line creating a “front mid-ship” layout while very short front and rear overhangs push the large diameter tyres to the vehicle extremities. The wheels are shod with run-flat tyres that eliminate the weight and weight-distribution penalty of a full-size spare tyre, while driver hip and heel points have been substantially lowered. 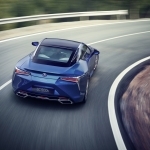 The centre of gravity has been further lowered by the introduction of numerous technical innovations which reduce the body weight of the LC 500h. These include aluminium front hood and fenders, aluminium door skins mounted on a carbon fibre structure, a carbon and glass composite boot lid, aluminium front suspension towers, ultra-compact LED headlamps, available forged alloy wheels and carbon fibre roof. The extensive use of strategically located high-tensile steel body structures reduces weight, improves weight-distribution and increases body rigidity, all of which promote consistent, predictable handling behaviour and sharper steering responses. 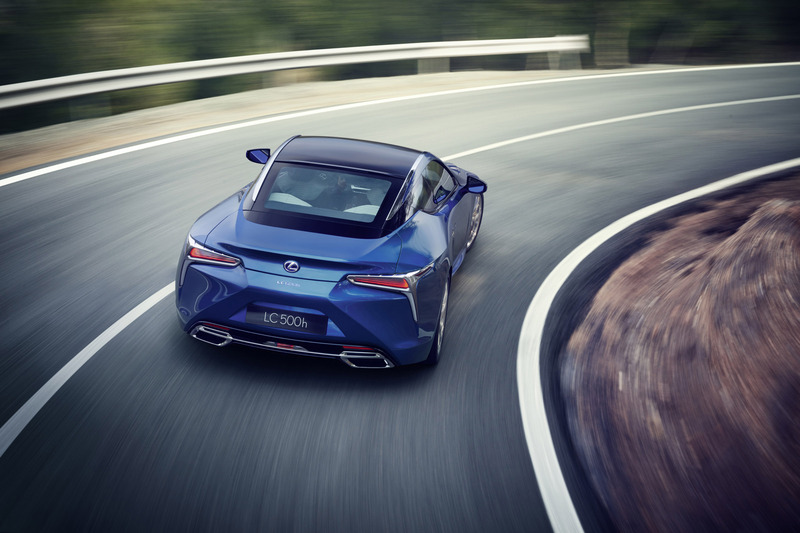 Particular attention has been paid to the development of the LC 500h's multi-link front suspension system, adopted to allow for the vehicle's large diameter wheels while at the same time accommodating a very low bonnet line. The system features two upper and two lower control arms, with double ball joints on each arm. This arrangement optimises suspension geometry to facilitate precise control from driver inputs and road conditions, creating a more precise steering response. Optimising the sharpness in both steering and suspension movement, sprung weight has been reduced as much as possible through the extensive use of lightweight, forged aluminium componentry. And the system demonstrates exceptional rigidity under lateral g loading. 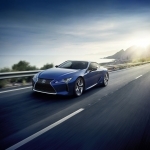 In combination, these chassis and suspension development measures offer an entirely natural, non-taxing driving experience which combines sharp responses, exceptional handing balance and straight line stability with the ride comfort appropriate to a Lexus flagship coupe. 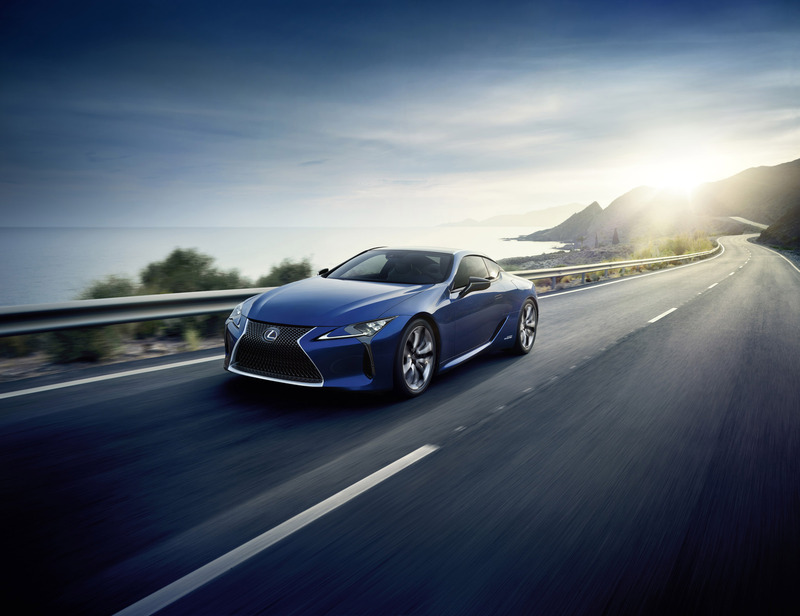 Class-Leading Safety Standards The new LC 500h is fitted, as standard, with the Lexus Safety System +, a newly developed portfolio of active safety technologies designed to help prevent or mitigate collisions across a wide range of traffic situations. 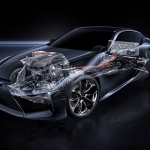 Combining a camera and millimetre-wave radar for a high level of detection performance, the Lexus Safety System+ features a Pre-Crash Safety (PCS) system with a pedestrian detection function, which helps prevent or mitigate the severity of collisions, All-speed Adaptive Cruise Control, Lane-Keeping Assist (LKA), and Automatic High Beam (AHB) headlamp technology.